Are you 1, are you 2, are you 3! 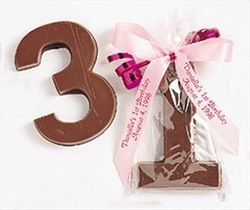 Our Chocolate Numbers are perfect for your child's Birthday. Made out of the finest chocolate, your guests will love these chocolate treats! The number 1 chocolate favor makes a great 1st Birthday Favor. Our chocolate numbers go all the way up to the number 9. So whether it's a 1st Birthday or a 9th Birthday, our chocolate favors are a delicious way to celebrate!